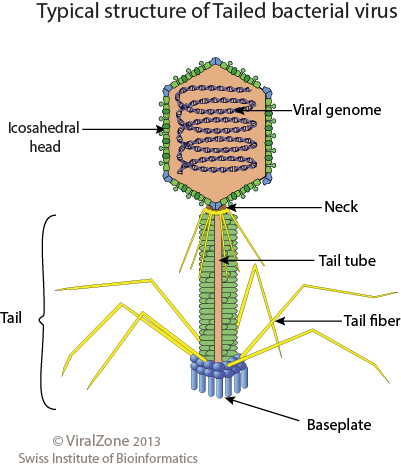 Some prokaryotic viruses have decoration proteins attached to their capsid. Decoration proteins are located on the outermost surface of the capsid and are involved in stabilizing the head structure. A variable number of fibers are attached to the distal part of the tail. These fibers are responsible for the specific, albeit reversible primary attachment to host cell. Due to high selective pressure, tail fiber genes evolve more rapidly than other phage genes and exchanges occur via horizontal transfer among phages crossing host phylogenetic boundaries . The baseplate is the most distal part of the tail of Myoviridae and Siphoviridae bacterial viruses. It binds to the host cell entry receptor, controls tail sheath contraction (in Myoviridae) and initiate genome ejection. Genome ejection is usually triggered by a change in the baseplate conformation .